Husk Cardstock: 8.5x11 letter-size sheet. 105 pound 100% postconsumer recycled paper. You can print 4 reception cards or direction cards on a sheet. Matching husk color. Response card: Matching Husk recycled cardstock. Response envelope: Husk A2 size (4.375x5.75) Envelope lining inserts of matching red mango mulberry paper (you glue in liners). Wedding Invitation. A Dramatic Invitation for a Winter or Autumn Wedding or Rehearsal Dinner. DIY Invitation with lined envelope. This design has been changed, due to the gold vellum being discontinued. We are now using an antique-gold paper that is pearlescent opaque. Outer envelope: Matching husk (70lb) square envelope with mango paper envelope liners (you glue in the liners). Invitation Sheet:Husk cardstock - 100% post consumer recycled paper. Handsome. 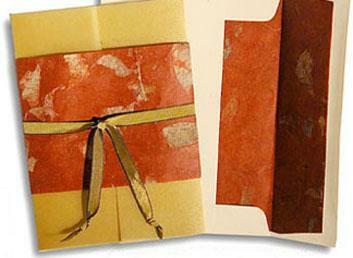 Bellyband:Red mango and mulberry paper - glues at back. Envelope:Husk 70 lb square envelope - 100% post consumer recycled. Very handsome. Envelope Liner:Matching mango mulberry - cut to size. Ribbon:One yard of 3/8" ribbon with finished edges. Extra DIY Paper:An extra 10% of the cardstock and envelopes are included for printing overage if you are printing these yourself. Microsoft Word templates if you plan to print these yourself.